﻿ How to Play RMVB on iPhone 5/iPhone 4S/iPhone 4/iPhone 3GS/iPhone 3G? Home » ios » How to Play RMVB on iPhone 5S/5C/5/4S/4/3GS/3G? How to Play RMVB on iPhone 5S/5C/5/4S/4/3GS/3G? This article will introduce a step by step guide on how to convert RMVB to MP4 for play RMVB on iPhone 5S/5C/5/4S/4/3GS/3G/iPad2/iPad/iPod/Apple TV/BlackBerry/Android Phone and other MP4 Players. Why Failed to Play RMVB on iPhone 5S/5C/5/4S/4/3GS/3G? On the one hand, iOS based devices like iPhone, iPad, iPod can only support MPEG-4, H.264, and MOV format; so did iPhone 5S/5C/5/4S/4/3GS/3G. On the other hand, RMVB is only compatible with Real Player; it is incompatible with other media players; even Windows Media Player or QuickTime cannot directly play RMVB, let alone to play RMVB on iPhone 5S/5C/5/4S/4/3GS/3G. How to Play RMVB on iPhone 5S/5C/5/4S/4/3GS/3G successfully? In order to successfully play RMVB on iPhone 4S, iPhone 4, iPhone 3GS, iPhone 3G or even play RMVB on iPhone 5, iPhone 5S and iPhone 5C, we have to convert this RMVB to iPhone supported video formats like MPEG-4, H.264 or MOV. 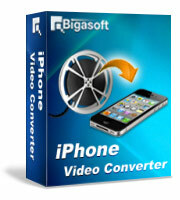 Bigasoft iPhone Video Converter is just the right RMVB to iPhone Converter. It can easily convert RMVB to iPhone support video format in order to easy play RMVB on iPhone 5S, iPhone 5C, iPhone 5, iPhone 4S, iPhone 4, iPhone 3GS or iPhone 3G. Besides, this powerful RMVB to iPhone Converter can also support convert and play RMVB on iPad/iPod/Apple TV/QuickTime/iTunes and more. Furthermore, it also can convert and play other video formats like AVI, WMV, WTV, MVI, MPEG, MKV, 3GP, FLV, ASF, MTS, VOB, RM, RMVB, TS etc on iPhone 5/4S/4/3GS/3G and more. It even can convert audio files including WMA, OGG, FLAC, MP2, AC3, RA, M4B, AAC, and CAF to iPhone of any type. This guide also applies to play RMVB on Mac, QuickTime, iMovie, iTunes, iPad, iPod, Apple TV, Samsung, BlackBerry, Zune, PS3, Xbox 360, PowerPoint, and Windows and etc, just remember to set the right output video format. 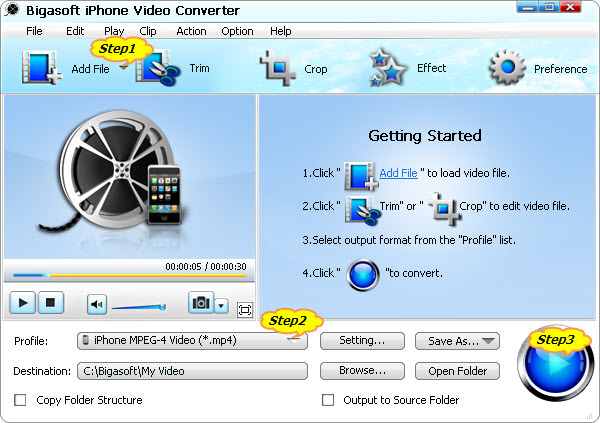 Free download Bigasoft iPhone Video Converter (for Windows, for Mac), install and run it. Click "Add File" button to import RMVB video file. Click the drop-down button on the right side of the "Profile" to select iPhone MPEG-4 Video (*.mp4) from the "iPhone" category. Click "Convert" button to finish converting RMVB to iPhone supported format. Start iTunes and connect iPhone to computer, and then sync the converted RMVB files to iPhone with iTunes just as you sync other files to iPhone. After finish syncing, just enjoy and play RMVB on your iPhone 5S, iPhone 5C, iPhone 5, iPhone 4S, iPhone 4, iPhone 3GS or iPhone 3G on the go.